Projects - Ontario - GFG Resources Inc. In December 2017, GFG announced its plans to consolidate a large, highly prospective land package west of Timmins, Ontario; the Pen Gold Project (Rapier Gold), the West Porcupine Property (Probe Metals) and the Swayze Project (Osisko Mining). (click here to see press release). The consolidated land package currently consists of 680 km2 and covers highly prospective geology in an under explored area. Previous exploration work and drilling on the properties have identified several distinctive and prospective zones of gold mineralization and targets that will be the focus of upcoming exploration programs. Moving forward, the properties will be described as the Pen Gold Project (which includes the Pen Gold property and the West Porcupine property) and the Dore Gold Project (previously the Swayze property). 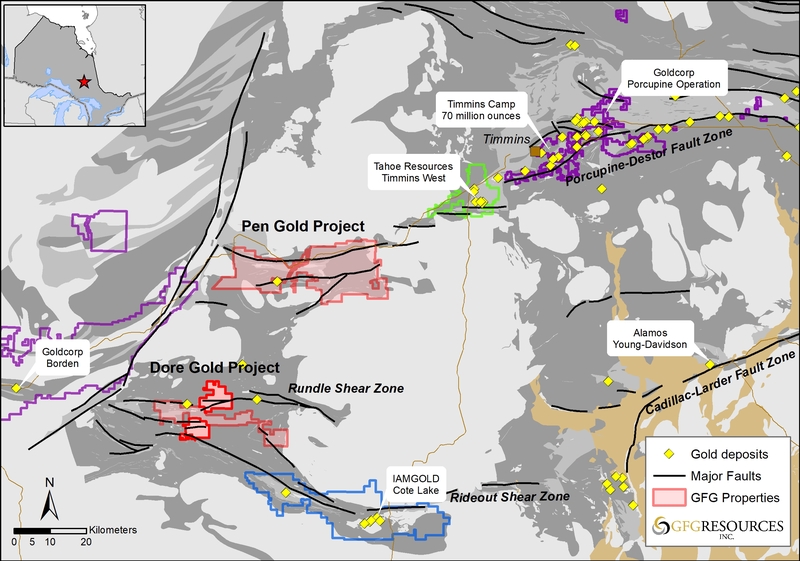 The Pen Gold Project, comprised of the West Porcupine and Pen Gold properties, is located 50 kilometres southwest of the prolific gold district and town of Timmins, Ontario and approximately 90 kilometres from Goldcorp’s Borden gold project. The property represents a land package of approximately 445 square kilometres and is situated between Goldcorp’s Borden gold project and the Tahoe Resources’ West Timmins Mine. The property consists of 162 claims and covers a 40-kilometer-long section of Archean greenstone that contains the interpreted western extension of the Porcupine-Destor Fault Zone within the same geological setting that hosts most of the gold deposits found in the Timmins Gold Camp. 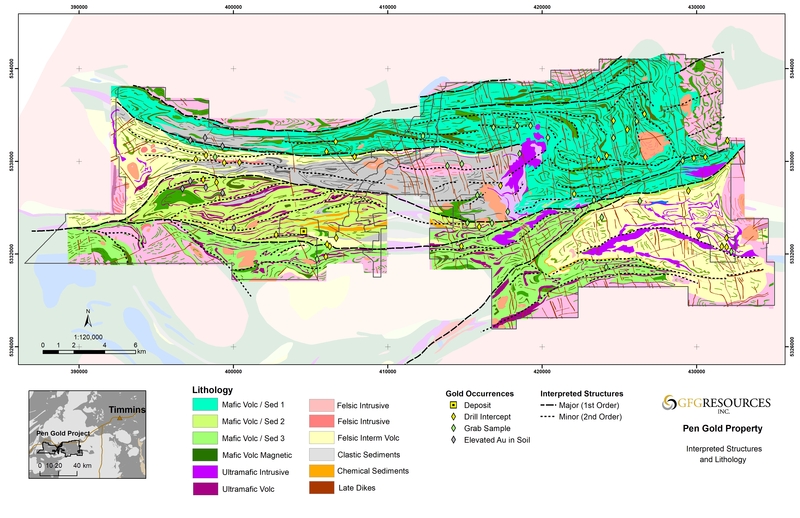 The Pen Gold Project is located in the Archean Superior Province of Northern Ontario. The Archean Superior Province is host to a variety of lithologies which range in age from 3.5 Ga to less than 2.76 Ga and form an east-west trending pattern of alternating terranes. It is divided into numerous subprovinces, bounded by linear faults and characterized by differing lithologies, structural/tectonic conditions, ages and metamorphic conditions. The Abitibi Subprovince, is a volcano-plutonic terrane comprising low metamorphic grade metavolcanic-metasedimentary belts. It contains lithologically diverse metavolcanic rocks with various intrusive suites and to a lesser extent chemical and clastic metasedimentary rocks. The individual greenstone belts within the Subprovince have been intruded, deformed and truncated by felsic batholiths. The east trending Abitibi and Swayze greenstone belts of the Abitibi Subprovince have historically been explored and mined for a variety of commodities. The Pen Gold Project lies within the Abitibi Subprovince, proximal to its western boundary with the Kapuskasing Structural Zone and the Ivanhoe Lake Cataclastic Zone. The properties are situated in the northern part of the Swayze Greenstone Belt and may be a possible western extension of the Abitibi Greenstone belt. The Pen Gold Project covers the interpreted westward extension of the Porcupine-Destor Fault Zone and is thus highly prospective for gold mineralization. 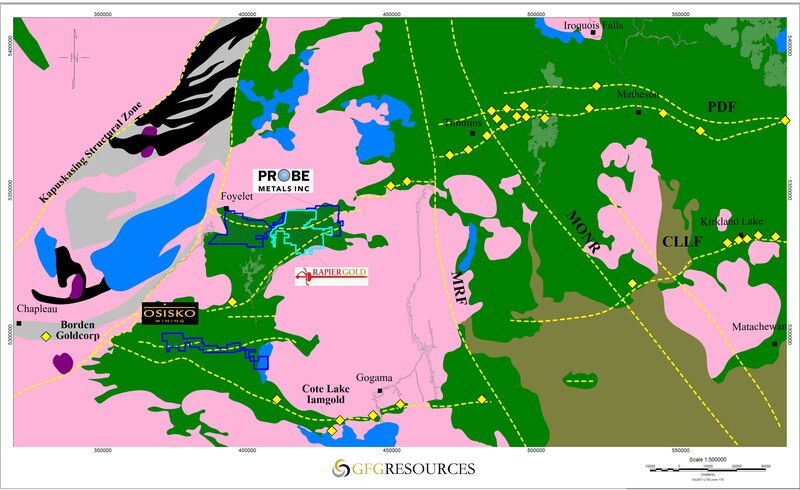 The Dore Gold Project (previously Swayze Gold Project) is located 40 kilometres east of Goldcorp’s Borden gold project and 30 kilometres northwest of IAMGOLD’s Cote Lake gold project in Ontario. 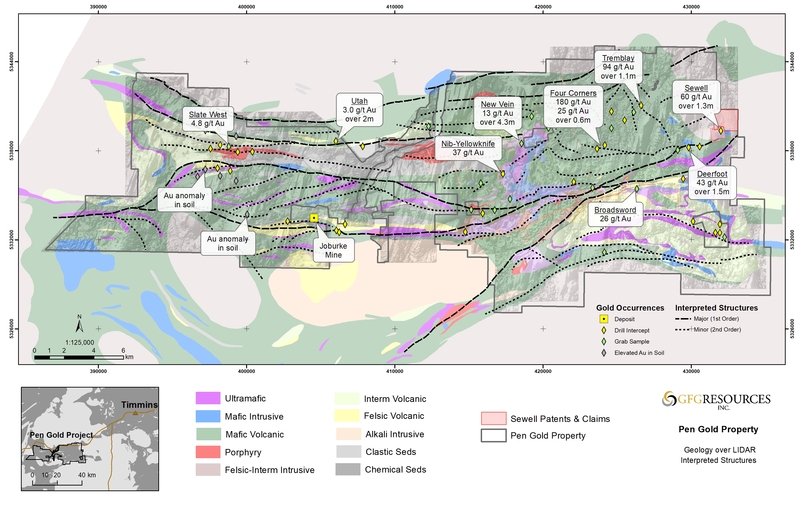 The land package consists of approximately 205 square kilometres and covers a 12-kilometre-long section of Archean greenstone within the Swayze Gold Belt Zone within the same geological setting that hosts most of the gold deposits found in the Timmins Gold Camp that has produced over 70 million ounces of gold. 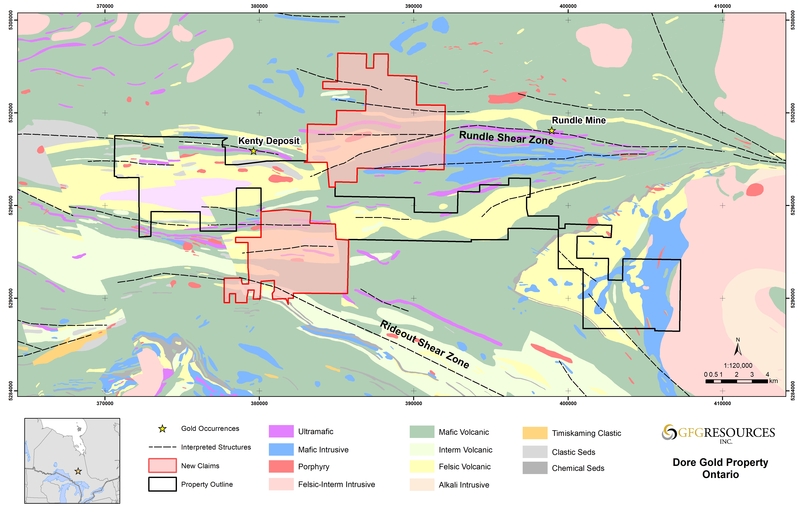 The Dore Gold Project is located within the Swayze Greenstone Belt that is part of the western extension of the Abitibi Subprovince, a Neo-Archean granitoid-greenstone belt. This greenstone belt is bounded to the west by the Kapuskasing Fault and to the east by the Kenogamissi Batholith. Several major fault systems transect the greenstone belt including the interpreted westward extension of the Porcupine-Destor Deformation Zone and the Ridout Fault. The Dore Gold Project covers east-west oriented Timiskaming-type volcano-sedimentary rocks that overlie mafic and felsic volcanic packages along the Rundle Fault Zone, located a few kilometers north of the Ridout Fault Zone that hosts the Cote Lake gold deposit. The western limit and central zone of the Dore property package is located within the Bret Lake synform, which is composed mainly of metasedimentary rocks and metavolcanic flows from the Swayze-Dore stratigraphic package. The rocks are a mixed group of felsic to intermediate pyroclastic and volcaniclastic rocks intercalated with epiclastic metasedimentary rocks of the Swayze series. Irregular feldspar-quartz porphyry stocks, dykes, and sills, and medium to coarse-grained diorite-gabbro intrude all rocks within the supra-crustal sequences. Northwest striking diabase dikes intrude all older lithologies. Known gold mineralization described in this area is related to shear zones; porphyritic intrusions, and quartz-carbonate-sericite veins with associated carbonatization, silicification, chloritization, and potassic alteration. The eastern-most claims of the property package cover the central section of the Bret Lake synform at the contact with a large intrusive center that include dioritic and syenitic marginal intrusive phases. Quartz-carbonate-sericite gold mineralization is reported in close special relationship with the intrusive rocks.